Ashley J George | AD-ventures of a Creative: Projects here, there and everywhere. Keeping busy keeps me happy and right now I am busy. There are a couple projects I am working on that I am super proud of. Here's a short update on a couple of them. Betsy took this, I stole it from her Facebook. At the agency, Betsy and I are working on a commercial for our client. That commercial is in production this week so you know I can't share much information about it. The producer and director were a great fit for this project and I can't wait to get everything wrapped up. With all the things I like to get myself into, I also like to keep a life on the side. This past weekend, I ran in The Color Run. SO MUCH FUN! 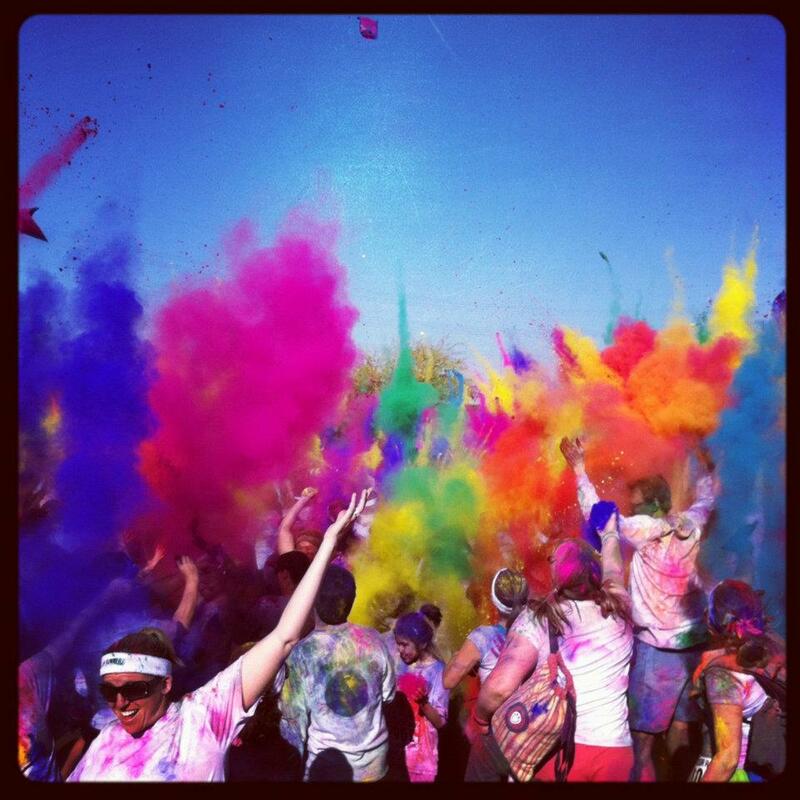 It's a 5K where every 1K you go through color zones where you are plummeted with this colored powder similar to flour. So, you start the race clean with a white shirt and end a colorful mess. After you finish the run, every 15 minutes, they have a powder toss where everyone throws the powder in the air, resulting in the photo above. If you can sign up for this I highly recommend it!! As I am typing this, Leroy is snoring on the couch next to me. He has been a true blessing in my life, reminding me of what really matters in life and being such a great stress reliever. We are planning on running the Run. Walk. Wag. 5K9 and I've been googling training programs on how to get him ready for 3.1 miles. He is so tired after 1.5 miles right now, so hopefully in about a month I can get him up to the 3 miles. If not, we will just do the 1 mile fun run. He can handle that without a problem. Are you planning on running this with your dog? Let me know and post a picture of your dog below! !